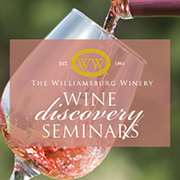 Join us on Wednesday, December 11th or on Thursday, December 12th at 6 PM at the Williamsburg Winery Tasting Room and Wine Bar in Merchant's Square for an evening of wine education and exploration. This month's seminar will focus on sparkling wines from around the world. Several small festival bites will accompany this tasting. Tickets are very limited. Please purchase your tickets in advance. Cancellations must be made by phone at (757) 258-0899 extension 190 at least 72 hours in advance to receive a full refund. No tickets will be mailed in advance. Please bring a copy of your order confirmation on your phone or in print as your ticket for admission.